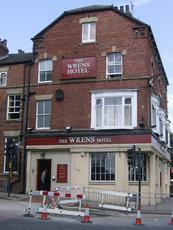 The Wrens was our penultimate pub in Leeds. Things had started to become a little messy and most of our party (including me) were onto gin or cocktails! This is a corner bar, with quite an impressive gin selection from memory. It felt bright and airy and had a number of small rooms. The 3 ales here were Black Sheep Holy Grail, Ilkley Mary Jane & Leeds Yorkshire Gold. Very well kept Taylor's Landlord in good-honest pub with friendly staff. Quirky interior worth seeing. A good pub which is often overlooked as it's sandwiched bewteen the new table dancing place, sandinista or whatever its called and gatecrasher across the road. Also upper briggate and its many takeaways is a mecca for the drunken leeds fighter. But don't let that put you off. If you want a no fuss pint and to mind your own business then this is the place for you. Friendly staff and the building has a rich history. Three roomed city centre pub, virtually opposite the Grand Theatre. Two of the rooms are quite plain, with the Theatre Bar much more ornate by comparison. Three regular ales: Timothy Taylor's 'Landlord', Black Sheep Bitter and Deuchar's IPA. The guest ale was Okells 'Dr. Okells IPA', which tasted fantastic, if a tad cold. It was so full flavoured it was hard to judge the quality of the 'Landlord', but it was served at a much better temperature. The young female barstaff were both friendly and helpful. Obviously popular with staff from the Grand. Slightly lacking in atmosphere, on this Thursday night visit, but worth another punt.